Energy & Utilities « Global Market Insights, Inc. The exponential growth graph depicted by the global threat intelligence market in the recent years can undoubtedly be credited to the massive surge in the number of connected endpoints. Presently, there are more than 3 billion end-users across the world that are connected to the Internet, while connected-devices are anticipated to surpass the 50 billion mark by year 2020. Having understood the dependency of these endpoints on the Internet to be able to interact with each other, cybercriminals have been exploiting the reliance to obtain an unauthorized access to the connected endpoint devices to undertake numerous malicious activities. The global threat intelligence market is expected to amass substantial returns from mobile-based solutions, due to the exponential rate at which cases of mobile cyberattacks & mobile frauds are growing. According to a 2018 report by ThreatMetrix, the first two quarters of 2018 witnessed the cases of mobile attacks across the globe reach the 150 million mark with attack rates growing 24% year-over-year. While the growing penetration of mobile devices has undoubtedly been a crucial factor in the rise of digital commerce, the trend has also proved to be extremely conducive for numerous malicious entities to carry out fraudulent activities. Moreover, other growing trends such as Choose Your Own Device (CYOD) & Bring Your Own Device (BYOD) being adopted across a number of enterprises, while facilitating greater convenience, are creating more vulnerabilities in the organization networks. Fueled by these trends the global threat intelligence market share from mobile-based solutions will grow at a CAGR of more than 18% over 2019-2025. As the global healthcare sector goes through a digital transformation, wherein it is adopting new technologies to enhance the level of patient care & medical treatments while continuing to facilitate patients with life-critical services, the vulnerabilities that are being created or exposed by this transformation phase are being treated as opportunities by criminal & malicious entities for their own personal gain. According to the Center for Internet Security, these threats range anywhere between malwares, that are designed to compromise the privacy of the patients & the integrity of the systems, to Distributed Denial of Service (DDoS) attacks, that are designed to hamper a facility’s ability of providing proper patient care. While these issues plague other industrial & infrastructural sectors as well, the ramifications of a cyberattack on a healthcare facility go far beyond financial losses & privacy breaches. According to the Southern Medical Association, as cyberattacks continue to proliferate, the global healthcare industry remains a primary target. In fact, 2017 witnessed the most successful data breaches in history, bringing legal consequences & detrimental financial losses to the victims and costing organizations more than $5 billion in accumulated financial losses & estimated total payouts. As healthcare organizations store a copious amount of information associated with their patients, cyberattacks, aiming to gain access to these data reserves, would be continuing to occur in the sector, generating significant opportunities for the threat intelligence market contenders. 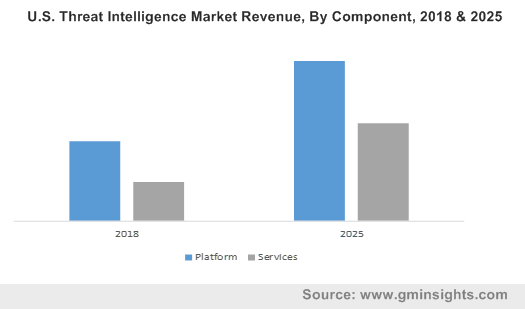 Indeed, the global threat intelligence market is projected to witness a CAGR of 13% over 2019-2025 from the healthcare industry. As with other sectors, the world’s government institutions are also making their transition to the digital world, leaving their conventional pen & paper practices behind for higher operating efficiencies. This trend has provided cyber-criminals an ideal opportunity, wherein they target specific government institutions for their own financial or idealistic gains. One recent instance of this is the cyberattack that targeted the local government of Atlanta, USA. According to the American Bar Association, the entire city of Atlanta was trapped in a hostage situation, wherein the city’s digital infrastructure was taken over by a powerful ransomware. The criminals disabled internet access, encrypted the files stored on the system and demanded an upfront Bitcoin payment in exchange for the decryption key that restored access to these files. According to federal authorities, the ransomware attack caused losses of more than $30 million and could cost taxpayers & the city more than $17 million to completely recover from the damages caused. Attributing to these three determinants, it is unmistakably clear, that the global threat intelligence market would be witnessing tremendous growth in the years to come. In fact, according to a report by Global Market Insights, Inc., the overall threat intelligence market size is slated to surpass the $13 billion renumeration mark by 2025. This entry was posted in Sustainable & Smart Technologies and tagged BFSI, Cloud, Energy & Utilities, File-based Solution, Government, Healthcare, IAM, Identity & Access Management, Incident Forensics, Internet-based Solution, IT & Telecom, Log Management, Managed Services, Manufacturing, Mobile-based Solution, On-Premise, Professional Services, Risk & Compliance Management, Security Information & Event Management, Subscription Services, Threat Intelligence Market, Threat Intelligence Market Analysis, Threat Intelligence Market Leaders, Threat Intelligence Market Share, Threat Intelligence Market Size, Threat Intelligence Market Value, Training & Consulting, UEBA, Unified Threat Management, User and Entity Behavior Analytics, UTM. Automated infrastructure management (AIM) solutions market has been experiencing considerable growth lately with the increasing need for automated documentation in data centers and commercial buildings. With the implementation of AIM solutions at the workplace, network administrators can improve the monitoring and provisioning of network connectivity. Prior to the advent of AIM solutions, myriad companies dealing with data management had been using manual tools which were prone to human errors. In addition, network technicians had to spend more time for updating and maintaining these documents, making the entire process time-consuming and expensive. Considering the difficulties associated with cumbersome documentation processes, the need to obtain cost-effective returns and operational benefits became all the more rampant, leading companies in IT, telecommunication, banking, and manufacturing sectors to preferably deploy automated infrastructure management systems on a large scale. The increasing acceptance for AIM systems for speeding up operations in the workplace is thus slated to fuel automated infrastructure management solutions industry size. As of now, most of the businesses are becoming digitally dependent and have been striving to transform their technology infrastructure. The initiatives taken by companies to develop digitized products and services will thus emerge to be one of the driving forces of automated infrastructure management solutions market. It is noteworthy to mention that the shifting focus of companies toward enhancing their operational efficiency by reducing the number of manual tasks with the help of automation is also certain to fuel the product demand over the years ahead. Taking into account the increasing acceptance of AIM systems, most players in the automated infrastructure management solutions industry have been continuously harnessing new technology trends such as IoT, AI, and AR. In 2016 for instance, BMC, New Relic, and Splunk incorporated artificial intelligence (AI) features in their IT monitoring tools to analyze data very effectively. The launch of application-centric advanced data management systems will thus lead to more companies wanting to use AIM solutions to resolve several IT infrastructural related issues, thereby propelling automated infrastructure management solutions market trends. The IT sector has constantly been on the lookout for simplifying their everyday tasks and saving copious amounts of time, on the grounds of which they have been looking forward to harnessing suitable problem-solving solutions. Validating the aforementioned fact, recently, the American multinational information technology company, Dell Technologies recently revealed a new IoT solution that can automate and provide scalable solutions for computing and IoT use cases. In cooperation with Intel, Dell has strengthened its computer vision and analytics technologies which will turn out to be beneficial for customers to support the workload through cloud services. The incorporation of artificial intelligence has also made AIM solutions more cost-effective, actionable, and efficient. Countries like the U.S. and Canada which have been prominently preferring automation for enhancing productivity will experience operational simplicity with the development of such IoT and cloud computing solutions, further advancing AIM solutions market growth. Incidentally, in 2017, North America held an appreciable 40% of the overall automated infrastructure management solutions market share on account of the robust digitalization and adoption of colocation services across both the aforementioned nations. Nowadays, the effectiveness of AIM systems to modify network security is making it highly popular across the globe. Companies operating across the BFSI sector have also been deploying AIM systems to restrict malicious and unauthorized users from accessing the server. In fact, it will be easier to locate any unusual remote activity on the system network with the help of automated infrastructure management (AIM) solutions. In this regard, for mitigating security issues related to the leakage of vital information and data storage, most of the financial institutions have been adopting AIM solutions. The growing importance of AIM for security, asset management, and problem-solving across commercial business spheres is likely to impel the product demand in the future. More importantly, the transformation of a physical infrastructure into data centers aided by software intelligence will help companies to commendably enhance their operations. 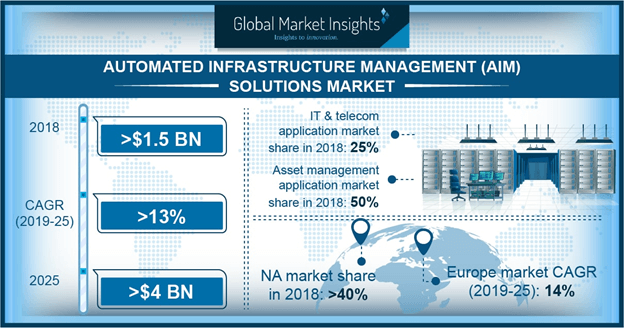 The surging deployment of AIM systems across myriad domains for improving data management facilities is poised to stimulate automated infrastructure management (AIM) solutions market size, which is expected to surpass a revenue collection of USD 3.5 billion by the end of 2024. This entry was posted in Electronics and Media and tagged AIM Solutions Market Share, Asset Management, Automated Infrastructure Management Solutions Market, Automated Infrastructure Management Solutions Market Size, BFSI, Colocation Data Centers, Device Discovery, Energy & Utilities, Government, Incident Management, IT & Telecom, Manufacturing. Disrupting the conventional ways of building digital infrastructure, the network automation market has emerged as one of the most enterprising niche verticals of the sustainable and smart industry. Prominent tech giants and multinational corporations around the globe have increasingly focused on implementing new methodologies to reduce manual configuration errors which are believed to cause the majority of network outages. In this context, network automation has evolved into one of the crucial technologies that have enabled businesses to decrease manual configuration errors and risk through effective compliance reporting, improved network service availability, enhanced performance and staff efficiency, and augmented data security infrastructure. As per reliable estimates, the overall network automation market size had been pegged at an appreciable USD 1.7 billion in the year 2017. Besides providing a wide range of connectivity applications, the SD-WAN technology has assisted numerous business verticals to reduce complexities in physical network infrastructure. The advent of advanced computing technologies such as machine learning and artificial intelligence has disrupted the digital business models – a factor that can be attributed for large scale adoption of SD-WAN technology in the last few years. In fact, as per a research study compiled by Global Market Insights, Inc., the SD-WAN technology apportioned more than 67% of the total revenue share of network automation market in 2017 and is anticipated to hold a prominent spot in the overall software segment in the upcoming years. To strengthen its service management portfolio and optimize its digital assets, IBM acquired the California-based network automation software provider Intelliden in 2017. Reportedly, Intelliden assists telecom firms to manage, configure, and scale their networks and automate an array of other services. Apparently, the technology of Intelliden would be integrated into IBM’s Tivoli Software which is known to enable various businesses to combine service delivery and significantly accelerate the automation of networks. With an aim to offer its customers an SD-WAN solution that is easy to deploy across enterprise branch offices and other WAN installations, Cisco has recently acquired an emerging WAN solutions provider Viptela for USD 610 million. Even though Cisco has a robust WAN product portfolio consisting of Intelligent WAN and Meraki SD-WAN, the addition of Viptela’s unique technology would reportedly expand and improve the overall functionality of the company’s WAN solutions in the times to come. Implementing network automation solutions through cloud-based services has lowered capital expenditure and operational costs, enabling enterprises to scale their technological capabilities at a faster pace. Primarily driven by growing opportunities to offer enterprises with additional services like monitoring, security, and application optimization beyond basic automation tasks, the network automation industry share is anticipated to expand vigorously over the estimated timeframe. 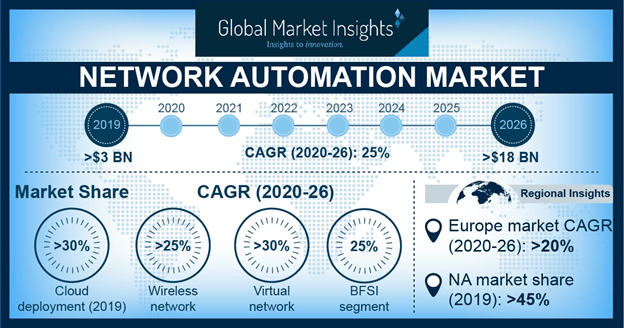 With rising investments by major tech firms coupled with innovative products being launched by startups, the network automation market size is forecast to register an excellent y-o-y growth rate of 22% over 2018-2024. This entry was posted in Sustainable & Smart Technologies and tagged BFSI, Cloud, Cloud Networks, Component, Data Center Networks, Deployment Type, Energy & Utilities, Global Network Automation Market, Healthcare, Hybrid Network, Intent-based networking, LAN, Local Area Network, Managed Service, Manufacturing, Network Automation Market, Network Automation Market Share, Network Automation Market Size, Network Automation Tools, Network Infrastructure, On-Premise, Physical Network, Professional Service, SD-WAN, Service, Software, Telecom & IT, Virtual Network, WAN, Wide Area Network, Wireless Networks.